July 1944, with the Jägernotprogramm. The Amerika-Bomber project was an initiative of the German Reichsluftfahrtministerium to obtain a long-range strategic bomber for the Luftwaffe that would be capable of striking the United States from Germany, a distance of about 5,800 km (3,600 mi). The concept was raised as early as 1938, but advanced, cogent plans for such a long-range strategic bomber design did not begin to appear in Reichsmarschall Hermann Göring's offices until early 1942. Various proposals were put forward, including using it to deliver an atomic bomb (which Germany ultimately never developed), but they were all eventually abandoned as too expensive, and potentially consuming far too much of Germany's rapidly diminishing aviation production capacity after 1942. According to Albert Speer's book, Spandau: The Secret Diaries, Adolf Hitler was fascinated with the idea of New York City in flames. In 1937, Willy Messerschmitt hoped to win a lucrative contract by showing Hitler a prototype of the Messerschmitt Me 264 that was being designed to reach North America from Europe. On 8 July 1938, barely two years after the death of Germany's main strategic bombing advocate, Generalleutnant Walter Wever, and eight months after the Reich Air Ministry awarded the contract for the design of the Heinkel He 177, Germany's only operational heavy bomber during the war years, the Luftwaffe's commander-in-chief Hermann Göring gave a speech saying, "I completely lack the bombers capable of round-trip flights to New York with a 4.5-tonne bomb load. I would be extremely happy to possess such a bomber, which would at last stuff the mouth of arrogance across the sea." Canadian historian Holger H. Herwig claims the plan started as a result of discussions by Hitler in November 1940 and May 1941 when he stated his need to "deploy long-range bombers against American cities from the Azores." Due to their location, he thought the Portuguese Azores islands were Germany's "only possibility of carrying out aerial attacks from a land base against the United States." At the time, Portuguese Prime Minister Salazar had allowed German U-boats and navy ships to refuel there, but from 1943 onwards, he leased bases in the Azores to the British, allowing the Allies to provide aerial coverage in the middle of the Atlantic. Requests for designs, at various stages during the war, were made to the major German aircraft manufacturers (Messerschmitt, Junkers, Focke-Wulf and the Horten Brothers) early in World War II, coinciding with the passage of the Destroyers for Bases Agreement between the United States and the United Kingdom in September 1940. Heinkel's bid for the project had occurred sometime shortly after February 1943, by which time the RLM had issued the Heinkel firm the airframe type number 8-277 for what essentially became its entry. The Amerika-Bomber Project plan was completed on April 27, 1942 and submitted to Reichsmarschall Hermann Göring on May 12, 1942. The 33-page plan was discovered in Potsdam by Olaf Groehler, a German historian. Ten copies of the plan were made, with six going to different Luftwaffe offices and four held in reserve. The plan specifically mentions using the Azores as a transit airfield to reach the United States. If utilized, the Heinkel He 277, Junkers Ju 390, and the Messerschmitt Me 264 could reach American targets with a 3 tonne, 5 tonne, and 6.5 tonne payload respectively. Although it is apparent that the plan itself deals only with an attack on American soil, it is possible the Nazis saw other interrelated strategic purposes for the Amerika-Bomber project. According to military historian James P. Duffy, Hitler "saw in the Azores the ... possibility for carrying out aerial attacks from a land base against the United States ... [which in turn would] force it to build up a large antiaircraft defense." The anticipated result would have been to force the United States to use more of its antiaircraft capabilities—guns and fighter planes—for its own defense rather than for that of Great Britain, thereby allowing the Luftwaffe to attack the latter country with less resistance. Partly as a liaison with the Wehrmacht Heer, in May 1942 Generalfeldmarschall Erhard Milch requested the opinion of Generalmajor Eccard Freiherr von Gablenz on the new proposal, in regards to the aircraft available to fill the needs of an Amerika Bomber, which had then included the Me 264, Fw 300 and the Ju 290. von Gablenz gave his opinion on the Me 264, as it was in the second half of 1942, before von Gablenz's own commitments in the Battle of Stalingrad occurred: the Me 264 could not be usefully equipped for a true trans-Atlantic bomber mission from Europe, but it would be useful for a number of very long-range maritime patrol duties in co-operation with the Kriegsmarine's U-boats off the US East Coast. Heinkel He 277 (as it underwent ongoing engineering development through 1943, itself first specified by its RLM airframe number by February 1943). Three prototypes of the Me 264 were built, but it was the Ju 390 that was selected for production. A verified pair of the Ju 390 design were constructed before the program was abandoned. After World War II, several authors claimed that the second Ju 390 actually made a transatlantic flight, coming within 20 km (12 mi) of the northeast U.S. coast in early 1944. As both the Me 264 and He 277 were each intended to be four-engined bombers from their origins, the troubling situation of being unable to develop combat-reliable piston aviation engines of 1,500 kW (2,000 PS) and above output levels led to both designs being considered for six-engined upgrades, with Messerschmitt's paper project for a 47.5 meter wingspan "Me 264B" airframe upgrade to use six BMW 801E radials, and the Heinkel firm's July 23, 1943-dated request from the RLM to propose a 45-meter wingspan, six-engined variant of the still-unfinalized He 277 airframe design that could alternatively accommodate four of the troublesome, over-1,500 kW output apiece Junkers Jumo 222 24-cylinder six-bank liquid-cooled engines, or two additional BMW 801E radials beyond the original quartet of them that it was originally meant to use. One idea similar to Mistel-Gespann was to have a Heinkel He 177 bomber carry a Dornier Do 217, powered with an additional Lorin-Staustrahltriebwerk (Lorin-ramjet), as far as possible over the Atlantic before releasing it. For the Do 217 it would have been a one-way trip. The aircraft would be ditched off the east coast, and its crew would be picked up by a waiting U-boat. When plans had advanced far enough, the lack of fuel and the loss of the base at Bordeaux prevented a test. The project was abandoned after the forced move to Istres increased the distance too much. Another proposal was the Daimler-Benz Project C. This was a huge carrier aircraft, carrying either five "Project E" aircraft or six "Project F" aircraft. The smaller aircraft had jet-engines and were designed to be kamikaze-airplanes. The Huckepack Projekt was brought up again at multiple joint conferences between the Luftwaffe and Kriegsmarine. After a few weeks the plan was abandoned on August 21, 1942. Air Staff General Kreipe wrote in his diary that the German navy could not supply a U-boat off the United States to pick up the aircrew. The plan saw no further development, since the Kriegsmarine would not cooperate with the Luftwaffe. Other proposals were far more exotic jet- and rocket-powered designs, e.g. a flying wing. The Horten brothers designed the Horten Ho XVIII, a flying wing powered by six turbojets based on experiences with their existing Ho X design. The Arado company also suggested a six-jet flying wing design, the Arado E.555. Other designs were rockets with wings. 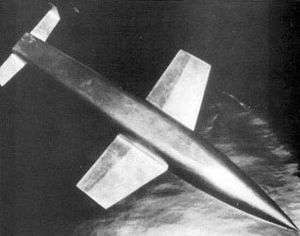 Perhaps the best-known of these today is Eugen Sänger's pre-war Silbervogel ("Silverbird") sub-orbital bomber. While the A4b rocket, winged version of the V-2 rocket and probably its successor A9 rocket were tested several times in late 1944/early 1945, the A9/A10 Amerika-Rakete, planned as a full 2-staged ICBM, remained a project. Included in the plan was a list of 21 targets of military importance in North America. Many of these would not have been viable targets for conventional bombers of World War II, operating from bases in Europe. Of these targets, primarily but not exclusively located in the eastern United States, 19 were located in the United States; one in Vancouver, British Columbia, Canada (a possibly achievable target for a similar Japanese project) and one in Greenland. Nearly all were companies that manufactured parts for aircraft, so the goal was likely to cripple U.S. aircraft production. According to British Intelligence, a German prisoner of war was quoted saying that since the beginning of 1944, "…regular air travel between Germany and Japan [was] established for the transport of high officials," and took place with the Messerschmitt Me 264. To put this into perspective, the distance from Frankfurt, Germany to Tokyo, Japan is 9,160 km (5,691 mi) whereas the distance from New York City to Paris is 5,840 km (3,628 mi). But in the case of bombing New York City, that distance must be doubled to 11,680 km (7,256 mi) as the bomber will need to make a return trip without refueling. Using classical bombs, it is unlikely the potential damages would be estimated important enough to sacrifice the bomber. The only German World War II aircraft built and flown that had anything close to this specified range was the Messerschmitt Me 261 Adolfine, with a maximum range of 11,025 km (6,850 mi). For the bomber to be an effective weapon, these engineering challenges need to be addressed. Had Hitler spent more time and resources on this project, it may have had a chance of working. However, unless Germany had possessed a cogent program to develop an atomic bomb, which would have taken even more time and resources, it is unlikely this aircraft would have made a big impact on the outcome of the war. Historian James P. Duffy believed that Germany had no central authority over the development and construction of advanced weaponry, including advanced military aircraft concepts and designs and an even more critical problem in developing conventional reciprocating aviation engines of power output levels of over 1,500 kW (2,000 PS) output apiece that could operate with reliability in combat conditions, needed to power ever more-advanced twin and multi-engined combat aircraft being designed after 1942. Because of this, German scientists were forced to compete for resources that were already scarce due to the war. Hitler was often swayed to spend more time, money and resources on his "miracle weapons" or projects that were exciting and new, but less likely to be successful. As a result, insufficient attention was also given to the Amerika-Bomber project. The project failed to come to fruition, not because the transatlantic bomber was not feasible, but because the Nazis were unable to manufacture enough parts to produce the aircraft. The Allied bombing was so intense near the end of the war it disrupted the German supply chain. Also, the German war machine was running very low on supplies, particularly fuel and kept what little was left for defense. Ultimately, all of these projects were deemed too expensive and ambitious and were thus abandoned. They continued to be of interest to aerospace engineers, as the British Air Ministry considered development of the Ho XVIII for an airliner after the war. Likewise, the theoretical groundwork done on the Sänger Silbervogel would prove seminal to lifting body designs in the space age. One source traces the concept of the US Space Shuttle back to the designs for the Amerika bomber. Nakajima G10N Fugaku design, a Japanese "Amerika-Bomber"
Northrop YB-35 and Convair B-36 — American long-range World War II-era-conceived, piston-engined heavy bomber designs meant to reach Germany directly from North America. 1 2 Griehl, Manfred; Dressel, Joachim (1998). Heinkel He 177 – 277 – 274. Shrewsbury, UK: Airlife Publishing. p. 179. ISBN 1-85310-364-0. ↑ Griehl and Dressel 1998, p. 184. ↑ Griehl and Dressel 1998, p. 185. ↑ Griehl and Dressel 1998, p. 186. ↑ Wagner and Nowarra 1971, p. 314. ↑ Griehl, Manfred; Dressel, Joachim (1998). Heinkel He 177 – 277 – 274. Shrewsbury, UK: Airlife Publishing. p. 187. ISBN 1-85310-364-0. ↑ "Project C." WW2 in color. Retrieved: 19 March 2015. ↑ "'Amerikabomber' -Hitler's plan to fly jets into NY skyscrapers re: al Qaeda/neo-Nazis/NWO/Bormann." abovetopsecret.com. Retrieved: 21 March 2015. ↑ "Project D: Above Top Secret." Something Awful. Retrieved: 20 March 2015. ↑ "Horten XVIII." luft46. Retrieved: 19 March 2015. ↑ "Arado 555." luft46. Retrieved: 19 March 2015. ↑ "Sänger." luft46. Retrieved: 19 March 2015. ↑ Holt, Nathalia (2016). Rise of the Rocket Girls. New York: Little, Brown and Company. p. 237. ISBN 9780316338929. Retrieved Sep 12, 2016. Duffy, James P. Target America: Hitler's Plan to Attack the United States. Guilford, Connecticut: The Lyons Press, 2006. ISBN 978-1-59228-934-9. Forsyth, Robert. Messerschmitt Me 264 America Bomber: The Luftwaffe's Lost Transatlantic Bomber. London: Ian Allen Publishing, 2006. ISBN 1-903223-65-2. Georg, Freidrich and Thomas Mehner. Atomziel New York - Geheime Großraketen- und Raumfahrtprojekte des Dritten Reichs. Rottenburg, Germany: Kopp, 2004. ISBN 978-3-9302-1991-9. Griehl, Manfred and Joachim Dressel. Heinkel He 177-277-274. Shrewsbury, UK: Airlife Publishing, 1998. ISBN 1-85310-364-0. Herwig, Dieter and Heinz Rode. Luftwaffe Secret Projects - Strategic Bombers 1935-45. Hinckley, UK: Midland Publishing Ltd., 2000. ISBN 1-85780-092-3. "Messerschmitt Me 264 & Junkers Ju 390". Luftfahrt History Heft 4, 24 February 2015. Smith, J.R. and Anthony Kay. German Aircraft of the Second World War. London: Putnam and Company, Ltd., 1972. ISBN 0-370-00024-2. Messerschmitt Me 264 & Junkers Ju 390 - "Amerikabomber" contra "Großraumtransporter"